A folder is a storage area on a drive, just like a real folder in a file cabinet. Windows 8.1 divides your computer’s hard drives into many folders to separate your many projects. For example, you store all your music in your Music folder and your pictures in your Pictures folder. That lets both you and your programs find them easily. Open File Explorer from the taskbar, that icon-filled strip along the bottom of the desktop. 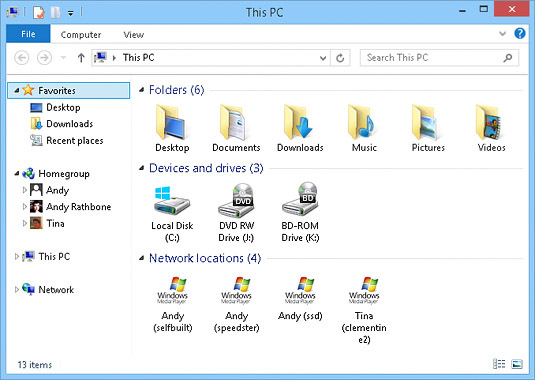 File Explorer appears with its Navigation pane showing along its left edge. Right-click a blank portion of the Navigation pane and choose Show Libraries from the pop-up menu. Be sure to click a blank portion of the Navigation pane, or you won’t see the pop-up menu that says Show Libraries. The libraries reappear in their usual spot on every folder’s Navigation pane. However, they’re still missing a key ingredient. 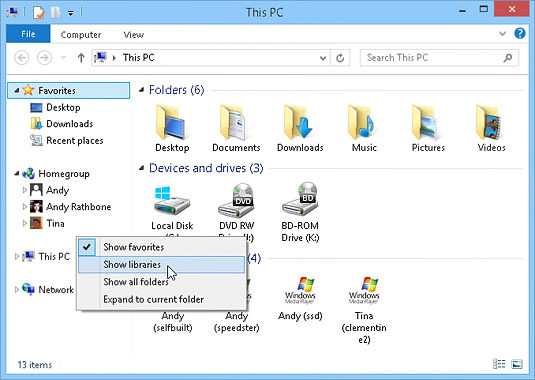 Windows 8.1 removed the Public folders from the libraries. Another article explains how to put the Public folders back into the libraries. Public folders make it easier for different account holders to share files on a single PC.